According to David Pogue, the Flip camera remains the #1 selling camcorder on Amazon in 2011, and accounts for 35% of the camcorder market. By all accounts, the camera has been a success. But it didn't start that way. The Flip camcorder started as a dead-simple digital camcorder that was thoroughly crippled to enable the single-use business model. Like other "disposable" cameras (I think "recycled" would be a better term), you bought the camcorder in a drugstore for $30, you recorded 20 minutes of digital video, and you brought it back to the store to be "developed". You'd get your movies back on a DVD, and you could re-buy the camera to shoot another 20 minutes. Open up an old Make Magazine to find details on how to reuse the camera yourself: find the right cable on eBay, do a bit of soldering, do some fancy footwork so your computer would recognize this as a USB device, and transfer the movies yourself, transcode them for playback, then reuse the camera. I'm not a hardware guy, but I do enjoy designing easy-to-use software, so I put together a Mac application to make this all seamless and elegant. Plug in the USB and out popped a DVD. 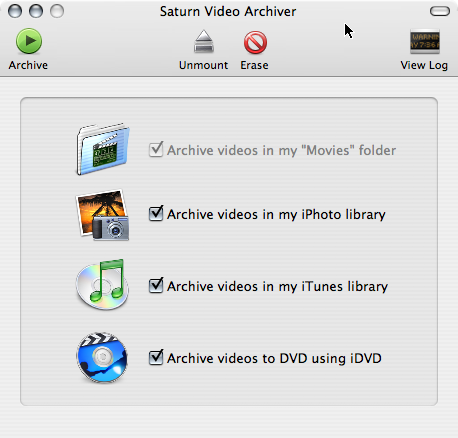 Your movies were transcoded for smooth Quicktime playback, media files were archived in iPhoto and iTunes, the resulting DVD had slick effects and transitions courtesy of iDVD, and -- my favorite feature -- the burned disc included a copy of my Mac application. I think this was the only code that I've written that was distributed on a disc. The result: I now had a one-button camera that shot digital video, and a one-button application that turned the footage into nice DVDs. The simplicity of it was fantastic. As with Berry, I'm not sure that anyone other than me ever used this software, but it was worthwhile just for the fun of it. The company making the camera ultimately added a built-in USB cable, made file transfer and movie sharing dead-simple, shifted gears away from a drugstore rental to an Amazon purchase, and the rest was history. I'd like to think that the guys hacking on v.1 nudged them a bit in the direction of openness, but that's idle speculation. In any case, my hack was no longer necessary, and the world got an amazingly popular simple digital video camera. Cisco bought it for $590 million dollars, apparently fumbled or reconsidered, and shut down the entire operation two years later. A few screenshots below give a sense of the simplicity of the user experience for my little app. This was the main interface. When you plugged in your camera, the selected methods of archiving would automatically begin. If you archived to DVD, a nice iDVD project would be set up. Movies were also nicely organized in the file system. An additional video file was created that included all clips from the camera in a single Quicktime movie with named bookmarked "chapters".